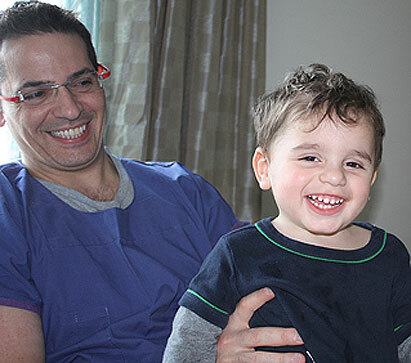 Massimo Damiani, 3, with his dad Stephen...Massimo's genome has been analysed to help better understand leukodystrophy. A University of Queensland researcher has been awarded an $85,000 grant to identify the genes that underlie rare paediatric brain disorders. Dr Ryan Taft from the Institute for Molecular Bioscience won a UQ Foundation Research Excellence Award after he analysed the genome of three-year-old Massimo Damiani, a Melbourne toddler afflicted with leukodystrophy. "Leukodystrophies are a set of illnesses occurring in children that cause a loss of brain function, and often result in premature death," Dr Taft said. "Unfortunately 50 per cent of leukodystrophies go completely undiagnosed, but using some cutting edge technologies we hope to change that." 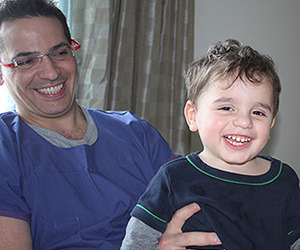 Dr Taft and his team used a method called whole genome sequencing to examine the genetic differences between Massimo and his parents, and identified a candidate gene that he thinks is likely to be responsible for Massimo's illness. The award will allow Dr Taft to search for these genetic mutations in other children, in the hopes of definitively identifying the cause of what had been an unsolvable case. "Not having a diagnosis has been incredibly difficult," Stephen Damiani, Massimo's father, said. "Although there is currently no cure for leukodystrophy, achieving a diagnosis gives us hope. It is the vital first step to one day developing a treatment for Massimo." Dr Taft will also use the funds to expand his research program to other families with children afflicted with these diseases. "By sequencing the genomes of other affected children and their parents, we hope to be able to pinpoint the genetic cause behind other subtypes of these rare brain disorders," Dr Taft said. "This will allow patients to be definitively and quickly diagnosed, and enable us and other researchers eventually to develop tailored treatments for specific types of leukodystrophy." These illnesses were the subject of the 1992 movie Lorenzo's Oil, which recounted the true story of parents who fought to find a treatment for their son's leukodystrophy. A report in medical journal The Lancet noted that Australia has neither a co-ordinated national plan for rare diseases, nor a funded umbrella organisation for these conditions. Yet rare diseases collectively affect more than 1.5 million Australians, with at least 400,000 of these patients younger than 15 years. The UQ Foundation Research Excellence Awards recognise outstanding performance and leadership potential among early to mid-career researchers.